Positive Detroit: Midtown's 40th Annual Noel Night Is This Saturday! 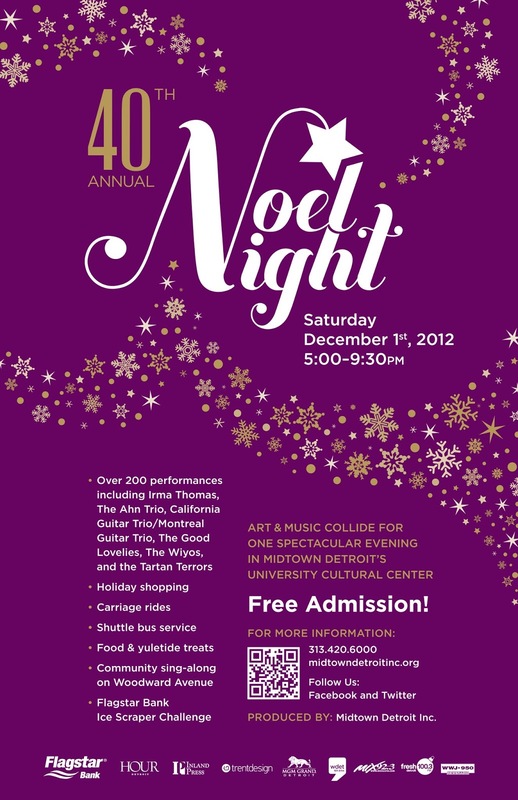 Midtown's 40th Annual Noel Night Is This Saturday! The 40th annual Noel Night will take place on Saturday, December 1st, 2012, from 5:00pm-9:30pm in Midtown Detroit's Cultural Center Area. Over 60 Midtown venues, including the Detroit Institute of Arts, the Charles H. Wright Museum of African American History, the Detroit Historical Museum, and the Detroit Public Library, amongst many others, open their doors to the public FREE of CHARGE during this Cultural Center-wide holiday "open house." Activities include horse-drawn carriage rides, holiday shopping, family craft activities and performances by over 120 area music, theatre, and dance groups. The evening's festivities culminate with a community sing-along on Woodward Avenue led by the Salvation Army Band — a long-standing Noel Night tradition. Noel Night activities take place in and around Midtown Detroit's Cultural Center institutions, primarily between Cass and John R and Kirby and Willis. Free shuttle service is offered between participating venues. Convenient parking is available in area lots. Noel Night is produced by Midtown Detroit, Inc., a nonprofit community development organization that supports economic growth in Detroit's Midtown district. For more information, click HERE or contact Midtown Detroit, Inc. at 313.420.6000.